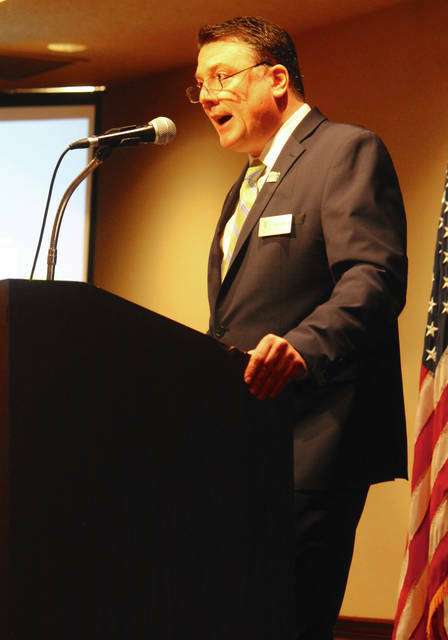 Anna Bolton | Greene County News Director of Department of Development Paul Newman Jr. updated community members on the county’s economic development April 20 at the Fairborn Holiday Inn. FAIRBORN — Greene County is continuing to experience positive growth, making 2017 the year to beat, according to Department of Development Director Paul Newman Jr.
“By all key indicators, 2017 was Greene County’s best year ever,” Newman said April 20 at the county’s Annual Report to the Community. According to Newman, 2017 residential and commercial construction values were strong across the board. The county’s 2017 total broke last year’s record with a 13 percent increase, totaling over $471 million. Broken down, residential construction increased 28 percent or $40 million. Commercial construction increased 65 percent at $114 million. Beavercreek Township holds the top spot in the county with the total residential construction valuation of $61 million — 96 percent higher than any other municipality. Sales tax collection continued on trend and increased to just over $27 million. General property tax collection increased by 1 percent to just over $38 million collected in 2016, the most recent year for reporting. The Convention & Visitors Bureau also reported its biggest year in history — increasing 13 percent with a $1 million lodging revenue — credited to the Mills Park Hotel and SpringHill Suites. Newman continued the positivity, reporting annual employment inching upward in 2016, the most recent year for reporting, reaching its highest level yet. Total wages were at a record $2.5 million. As far as unemployment goes, the county averaged 4.3 percent. This compares to the nation’s 4.4 percent and the state’s 5 percent. As of February, the county average was down to 3.9 percent. The county is doing this through the Greene County Career Center’s Take Flight Initiative. Take Flight — which expands school programming to include aviation, aerospace, engineering, manufacturing and information technology — has already reached Beavercreek middle schoolers. Recent state funding will go toward facilities and equipment to train airframe and power plant technicians, including at the Greene County Lewis A. Jackson Regional Airport. “Take Flight not only aligns with the Department of Development’s strategic vision and growth initiatives, but also helps develop a pipeline of enrollment into advanced education opportunities that are aligned with workforce needs,” Newman said. The airport recently completed construction of a 75,000-square-foot corporate hangar. A public water and sewer extension to the airport is in the works. And the airport is extending its runway to 5,000 feet to allow for larger corporate and business jets. “These aircrafts not only spend thousands of dollars in fuel, maintenance and rent, they provide an economic stimulus to area hotels, restaurants, and businesses. [It’s] revenue we will no longer lose to larger airports,” Newman explained. Newman additionally credited the county’s prosperity to WPAFB — and its 27,000 employees, 60,000 indirect jobs and more than $4 billion in economic impact. Communities experienced significant development over the year, too. Fairborn: Spark Fairborn, a kitchen incubator initiative, already opened The Neighborhood Nest. Major employers like Menards and Pepsi are also coming, and bringing jobs. Beavercreek: Up-and-coming companies — which have built or will build, and are adding local positions — include Frontier Technology, Inc., Matrix Research, Inc. and MacAulay-Brown, Inc. Russ Research Center continues development as well. Xenia: The REACH Center broke ground. Hamption Inn & Suites should be completed soon. Downtown is developing, too — including newly-opened Devil Wind Brewing. Development for the former Kmart is expected to begin by the end of the year. And Greene Regional Business Park has obtained certified-site authentication. Yellow Springs: The village added 3,000 solar panels to its electrical grid. It received a $65,000 grant from Ohio Department of Transportation to improve cyclist and pedestrian safety. And Cresco Labs is planning its facility. Newman spoke of 2017, but looked to the future, too. “Efforts will be directed toward creating a diversified economic base and attracting, developing and retaining a competitive workforce,” he said. https://www.xeniagazette.com/wp-content/uploads/sites/32/2018/04/web1_Newman1.jpgAnna Bolton | Greene County News Director of Department of Development Paul Newman Jr. updated community members on the county’s economic development April 20 at the Fairborn Holiday Inn.